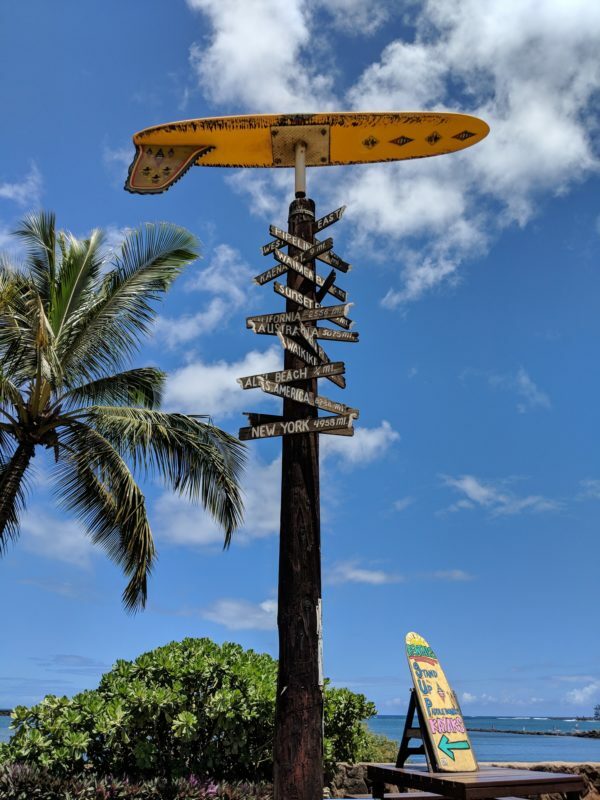 Home BlogOahu Walking My Way Through Haleiwa Town – See, Eat, Do! Haleiwa Central at Matsumoto's Shave Ice. If North Shore, Oahu is on your list, then at some point you’ll end up at Haleiwa. This is a surf town that has roots way back to the late 1800s when getting here took 2 hours by train! But don’t worry, driving here these days doesn’t take that long anymore (except during traffic, yikes!). For those only coming to Haleiwa, I’d suggest getting here by 10 AM to get some early-bird parking. Keep in mind that the traffic from Haleiwa to and through the North Shore begins to look horrendous from 10 AM so keep that in mind when planning your North Shore itinerary. Have fun shopping and eating! 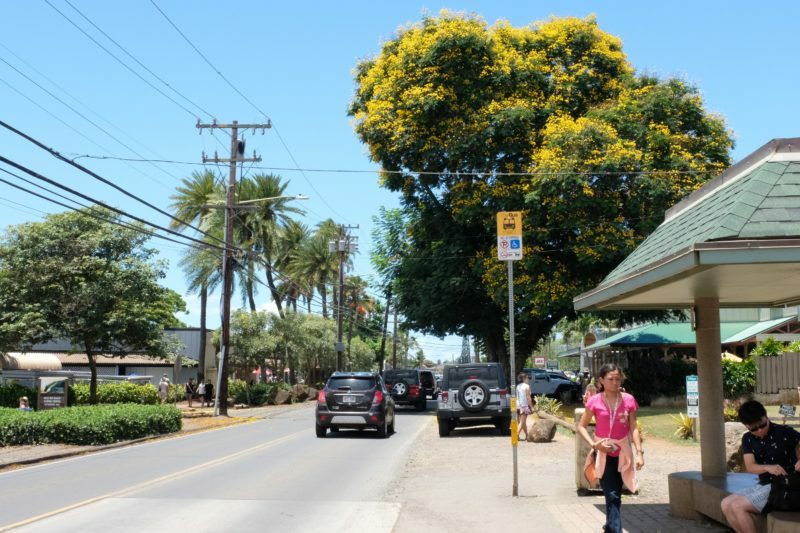 The majority of stores in Haleiwa Town are either small boutique stores, restaurants, and food trucks. Almost all restaurants have some kind of outdoor (and indoor) seating and the variety of food ranges from popular Mexican and Italian to Thai, Vietnamese and sub sandwiches. 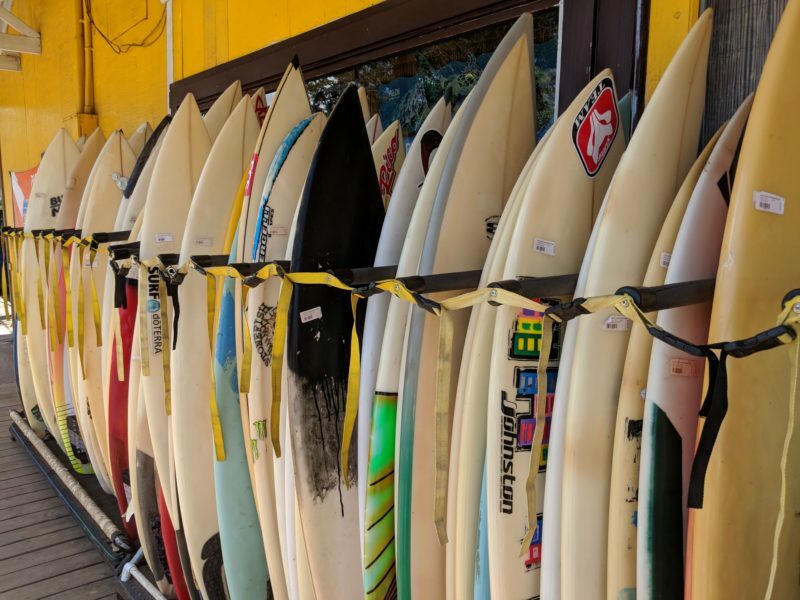 There are a few rental shops dotted along the main strip, but you’ll find most of the watersport rentals and surfing lessons at the end of Haleiwa Town right after the Anahulu bridge. 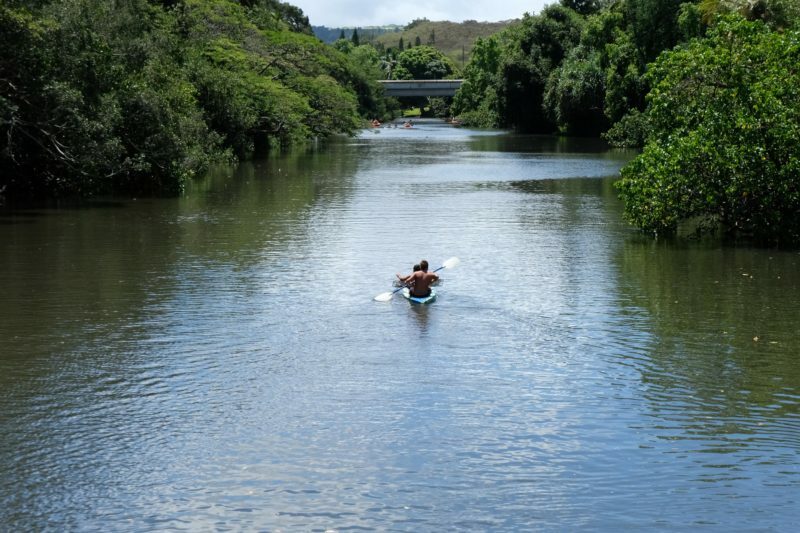 Local Tip: Anahulu river is one of the best places to see turtles on Oahu! You can kayak or stand up paddleboard up and down this river and see these cuties swim right next to you. 2 young local boys kayaking up Anahulu river with crab cages and Tilapia for bait. I captured this shot of 2 sun-darkened boys as they paddled their way eagerly upriver. They were chomping at the bit to get going as their Dad yelled instructions and reminders out to them from under the shade of a tree. I could smell the raw fish they were carrying from the bridge – my nose was straining, it was so pungent. But any good Hawaii fisherman knows that crabs are scavengers and the stinkier, the better. My guess is they were going for Samoan crabs. Yum! 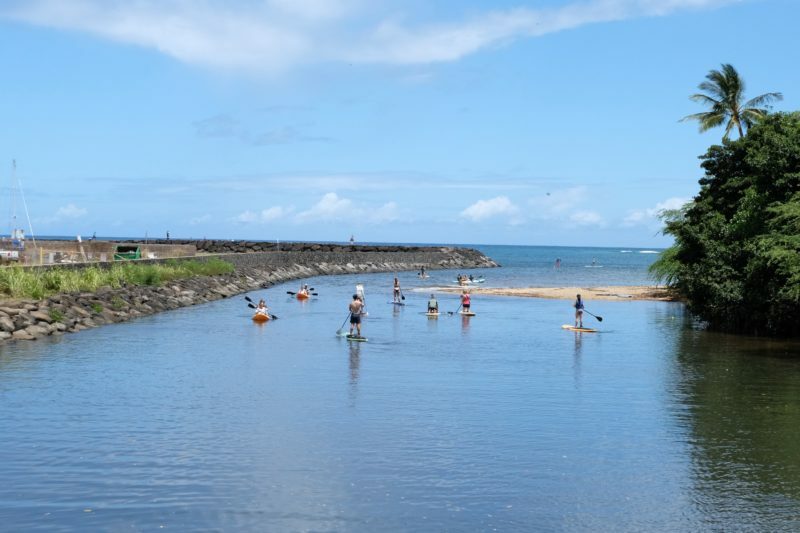 Paddleboarders and kayakers heading in and out of Anahulu River. Rain or shine, I always enjoy the drive to Haleiwa. 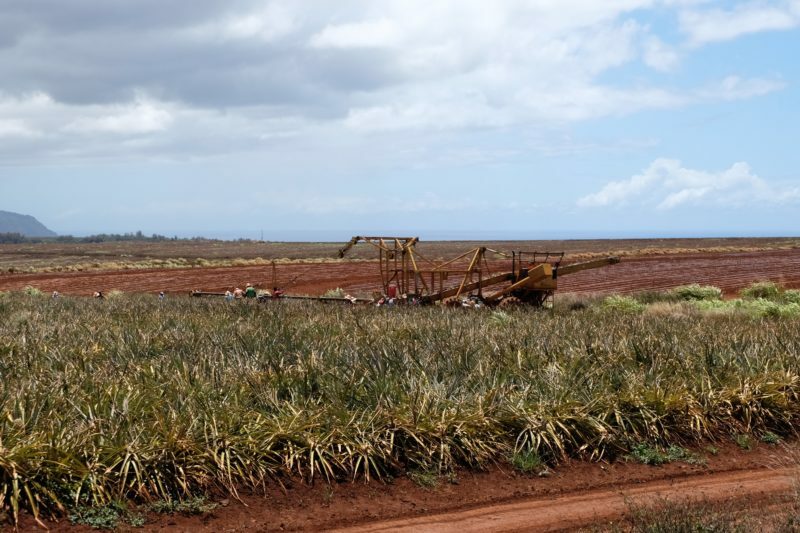 As soon as you pass Dole Plantation, you’ll see fields and fields of pineapples stretching to the Waianae mountain range to your left. On this day, I was particularly lucky since the pineapple pickers were close to the road. 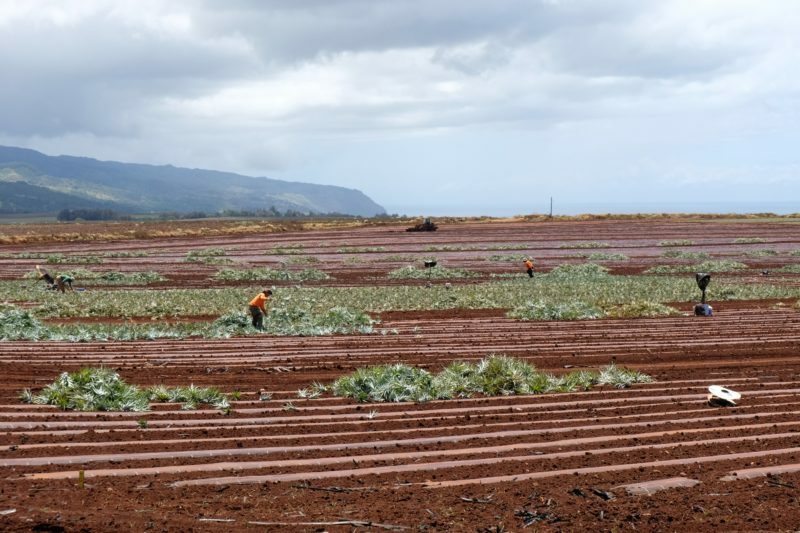 Pineapple pickers hard at work under the Hawaiian sun. If you take a close look, the man in bright orange is flinging pineapple crowns out behind him by the handfuls. You have to give these men and women a lot of credit – this is backbreaking work in the hot, hot sun. Fun fact: My Dad pineapple picked once as a summer job and said that it was so dirty that it took 2 baths to get all the dirt off. My Aunty on the other hand only lasted 1 day before she quit. Don’t tell her I tattled! Pineapple picking with a machine. Local Tip: Drive down Kamehameha Highway with the windows down if you’re not too worried about mussing up your ‘do. If you’re lucky, the scent of ripe pineapple will tingle your nose as you drive by, accompanied by the sound of the rustling California grass that line both sides of the highway. 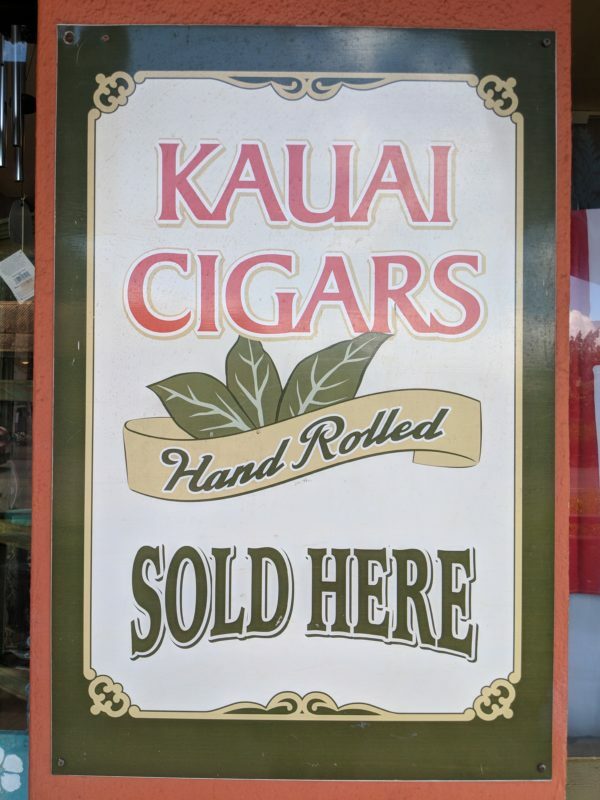 Roughly half of the small shops in Haleiwa Town sell unique brands that you probably haven’t heard of. Swimsuits, clothing, jewelry, “antiquey” souvenirs, surf shops, home decor, local art galleries, farmers’ market, seashell decorations and even ukuleles. Local Tip: I recommend Haleiwa shopping for those who enjoy this “tiny shop” atmosphere. If you stray from big brands and love supporting local or souvenirs that only come from 1 store, Haleiwa is perfect for you. A unique old-school banner while window shopping. Splash! Hawaii stores are popular for featuring made in Hawaii swimwear. 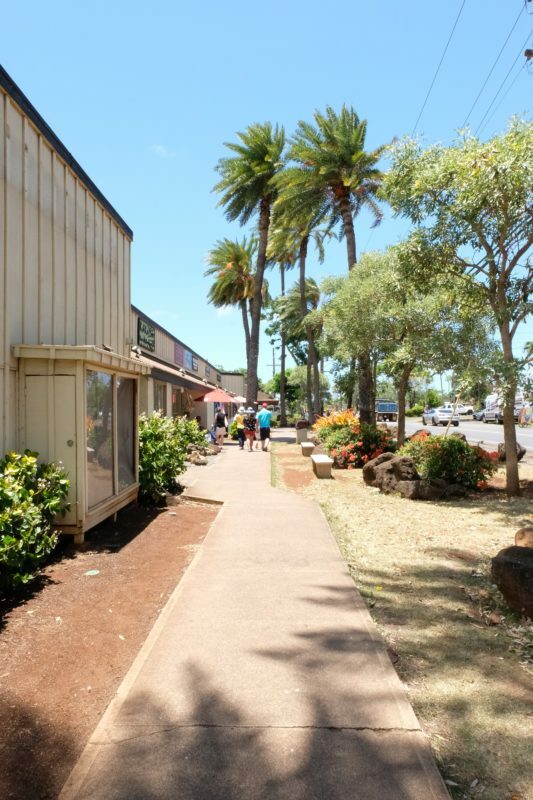 The length of Haleiwa town is a pleasant walk regardless if you’re a heavy shopper or not. From end to end it takes most people 1 – 2 hours depending on how much time they spend in each store. 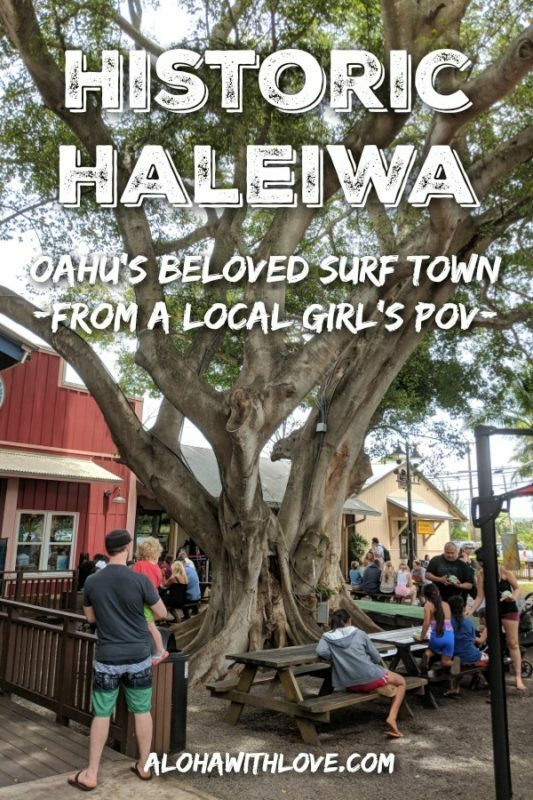 On this particular trip, I parked at the Haleiwa Store Lots (it’s close to one end of Haleiwa so it makes for a good spot to begin your shopping/stroll. 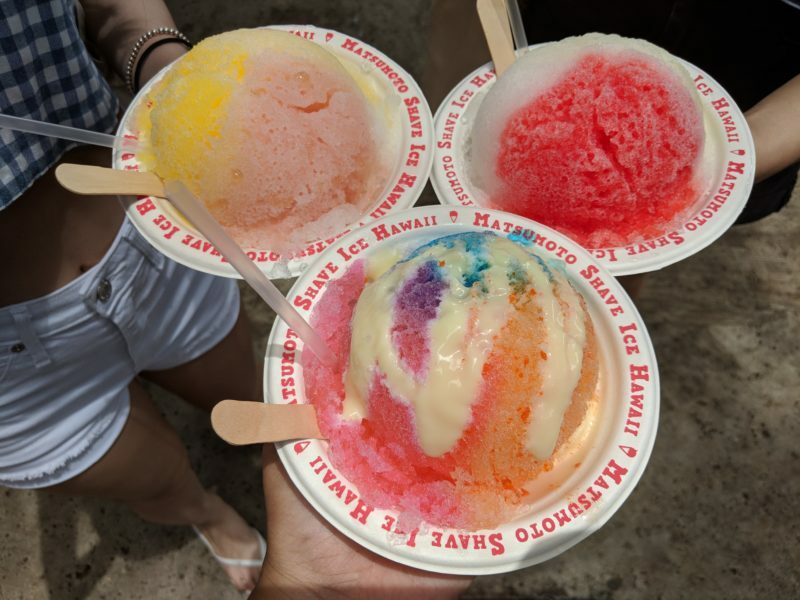 Local Tip: My 2 favorite places to park is at the Haleiwa Store Lots (near Matsumoto’s Shave Ice) and the North Shore Marketplace (near Wyland Galleries). If you can’t make it to either of these parking lots, street parking is still available, just be respectful of those who live here and follow all “no parking” signs. A pleasant outdoor walk along the storefronts. Don’t have a car? Not a problem. Many Hawaii visitors come to Haleiwa by bus (#62 I believe will take you here and beyond from Ala Moana Center). A bonus to coming by bus is that you can catch a ride to what I like to call the “food truck lot”. There are several bus stops throughout Haleiwa town. The food truck lot is a bit of a far walk from the main part of Haleiwa, but it’s a must for any heavy-duty foodies out there. This place is hopping during lunch time, so try to get here at 11 AM or 1:30 PM to avoid the mad rush for delicious food truck chow. Surfboards aplenty. Don't worry, someone will help you choose. Out past Anahulu River and the bridge is where you’ll find the watersport rental shops. You can sign up for lessons, tours and rental gear here if you’re interested in venturing out further into the North Shore. Or, click here to book in advance and plan your itinerary. I honestly believe that there are more places to eat in Haleiwa than there are shops. If ever there was a time to research in advance your meal in Hawaii – this is the time to do it. On this particular visit, I came with my Mom who adores her Mexican. So we went to Cholo’s Homestyle Mexican, which serves your mainstream Mexican dishes. If you aren’t too crazy on trying something new, you won’t be too surprised here. Huge servings with colorful margaritas! 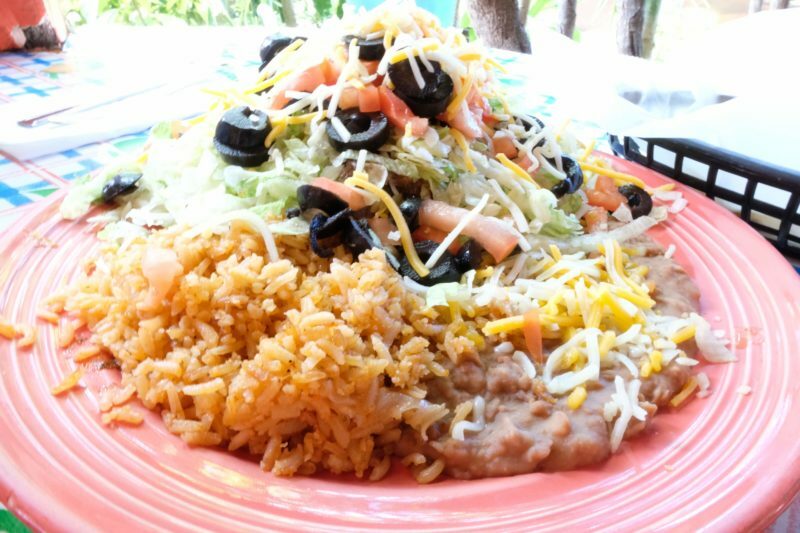 Mom loves her salad, rice and refried beans. 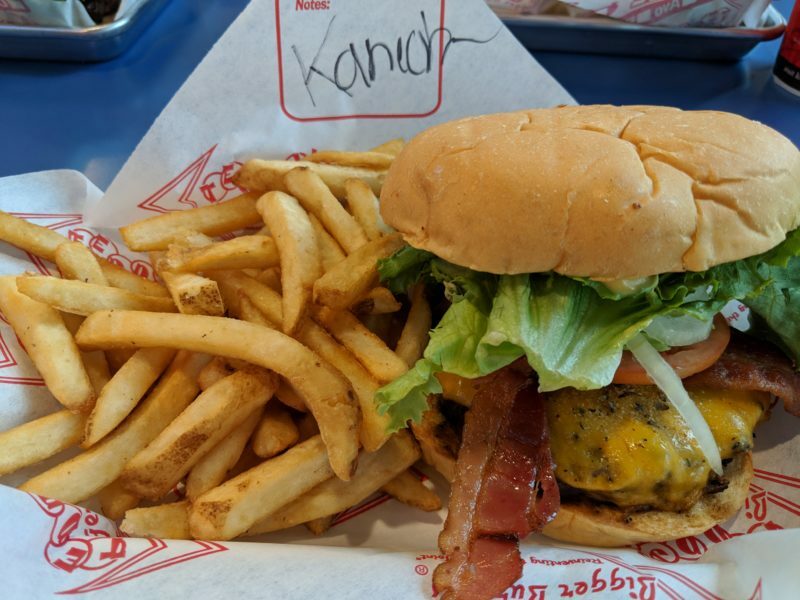 Usually I avoid eating burgers when traveling – I’m that person who wants to try something totally new – but Hawaii’s Teddy’s Bigger Burgers chain is a must if you love your burgers. They do a FANTASTIC job on their burgers, fat and crispy fries and really, really, really thick shakes! A visit to Haleiwa is not complete without a stop for shave ice. And if you’re gonna get shave ice, you have to do it right – Matsumoto’s Shave Ice. You’ll know you’re in the right spot when you see a crowd of people forming a line. Local Tip: Mine is the one with condensed milk on the top. It just makes your tongue curl that much more when savoring this sweet icy treat. A prior visit with my cousin and her college roomie. Kono’s – 12-hour slow roasted kalua pig. Haleiwa Joe’s – The prime rib is about 2 inches thick! Storto’s Deli – Think Subway, but with waaay more choices. Hono’s Shrimp Truck – Personal favorite for North Shore shrimp trucks. This isn’t my best picture, but you have to admit that the arched stone wall covered with cacti (night-blooming cereus?) certainly draws your attention. If you are interested in attending a service, visit their site for more information. 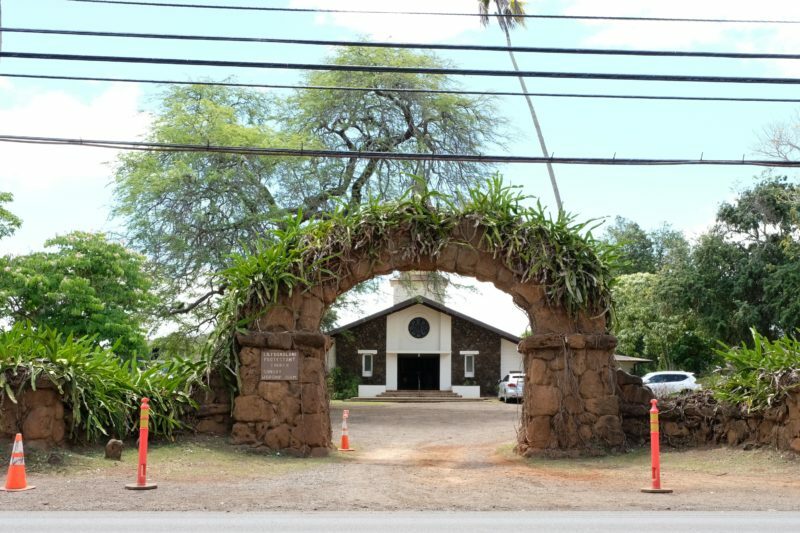 Local Tip: The Liliuokalani Protestant Church’s annual luau is locally famous for its food. Not only is it delicious and authentic, but it’s also prepared traditionally and from scratch! You can also watch how they cook the pig in the imu (traditional underground oven) and are invited to bring your cameras. 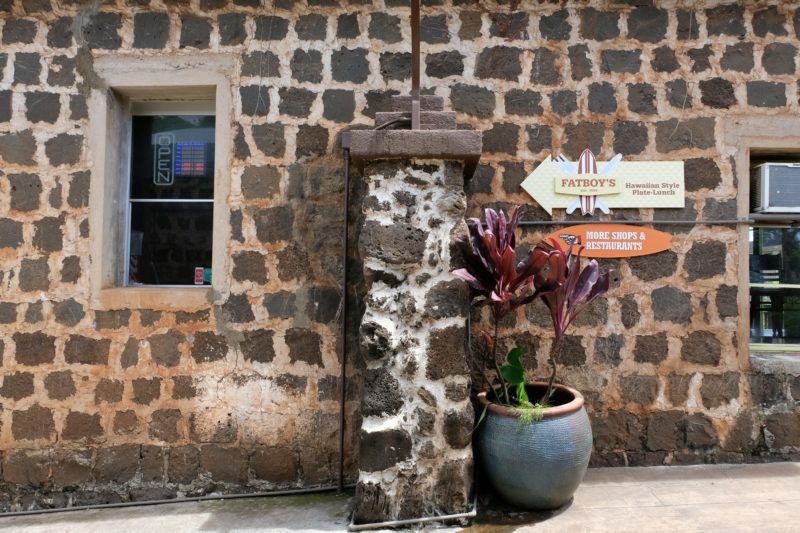 You’ll come across random old buildings that may have been here since the old pineapple-picking days of Haleiwa. History buffs should check out this walking tour hosted by the North Shore Chamber of Commerce. There’s a reason why Haleiwa is also called “Historic Haleiwa” and it’s just $10! Follow the sign to Fatboy's for a great plate lunch. This little guy caught me off guard! 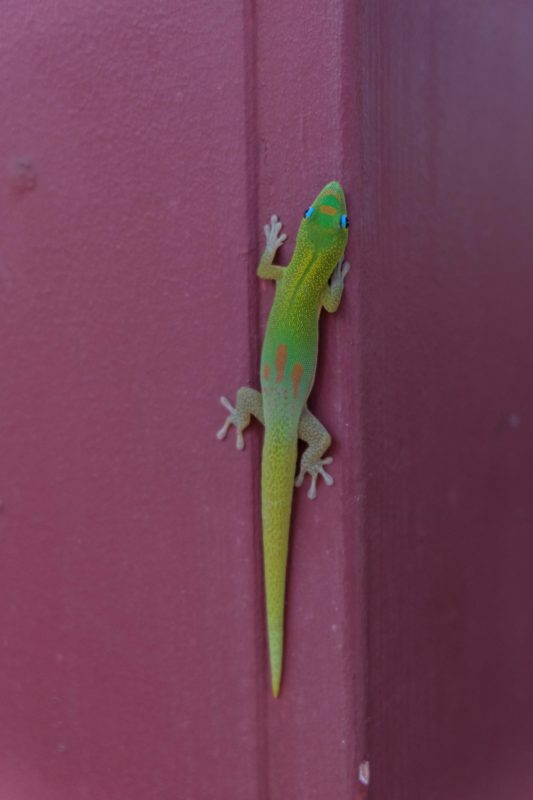 I’ve seen plenty of Gold-Dust Day geckos in my yard and on forest hikes, but I never expected to see one ambling along the outside of a building. While these guys aren’t native to Hawaii (as are most geckos and lizards), they sure are pretty. A Gold-Dust Day Gecko running away from me. 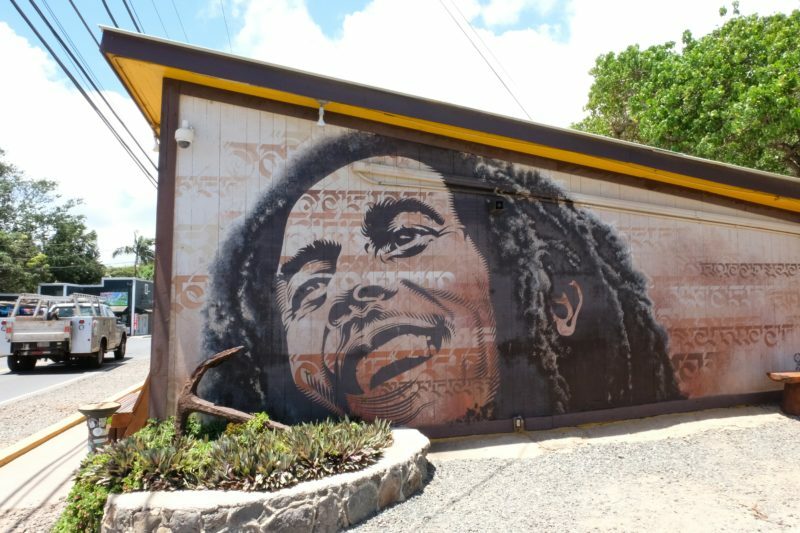 If you make it past Anahulu bridge, the Bob Marley wall will be on your left right after a surf shop. There are quite a few wall paintings in this area, which makes for a neat mini tour as you visit the surf and rental shops in this area. Local Tip: Be careful crossing the street here. There are no crosswalks and everyone tends to dash across the street to get from store to store. 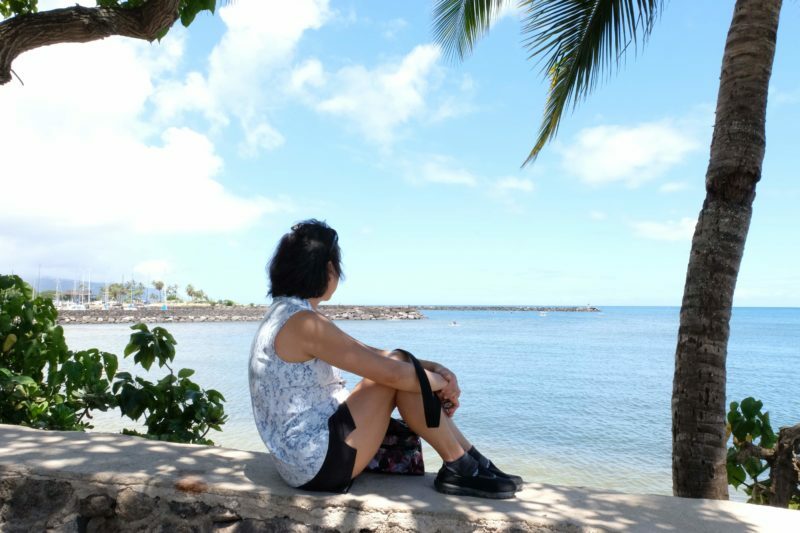 Next to Bob Marley, Mom and I decided to take a break and gaze across Haleiwa harbor. It doesn’t look like it, but to the left of this photo were dark rain clouds gathering on the Waianae mountain range. Local Tip: This stone wall runs along the length of the shore through Haleiwa beach park. If you’d rather pick up lunch and eat with a view, park your car at Haleiwa beach park and find a nice, shady spot to sit and chow down. Model Mom hard at work. Expect to spend at least 2 – 3 hours in Haleiwa Town exploring (and eating). It’s easy to get tired since you’ll be spending so much time walking under the sun. In fact, it’s a great idea to pair this with a visit to the beach so that you can spend the other half of your day relaxing on the sand or floating in the gentle waves. Local Tip: My favorite way to economically spend time in Haleiwa town and on the North Shore beaches is to split it into 2 separate days. One day can be Haleiwa town (shopping and eating) and Haleiwa beach or Anahulu river activities. The 2nd day is visiting the North Shore beaches when you do your Oahu circle island tour. I highly prefer this method of splitting Haleiwa town and North Shore beach visits into 2 separate days mainly because you’ll get to avoid the North Shore traffic. Let Haleiwa take you to where you want to be. Let’s talk! I want to know if this post on Haleiwa Town helped you out. Let me know what you think below so I can help you and everyone else make your Hawaii vacation an awesome one!